The Japanese-Canadian community has been an integral part in forming the city of Vancouver we live in today. Along with sushi stores, ramen restaurants, and cherry blossoms, we’re blessed to be around some of the best taiko performing groups in Canada. Join us this Canada Day and enjoy the engaging drumming show brought to you by Canada’s first children’s taiko ensemble, Chibi Taiko! They might be young in age, but trust us, they will have zero problem in presenting one of the best taiko performances you’ll see! The first children’s taiko ensemble in Canada, Chibi Taiko was formed in the fall of 1993 with the goal of passing this unique and dynamic performing art on to the next generation of Asian Canadians. 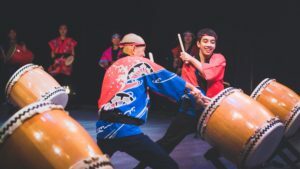 The group’s philosophy emphasizes cooperation, leadership, responsibility and spirituality in addition to the physical and musical discipline needed to build a cohesive and dynamic taiko ensemble. Chibi Taiko is a member of the Vancouver Taiko Society. Taiko are a broad range of Japanese percussion instruments. 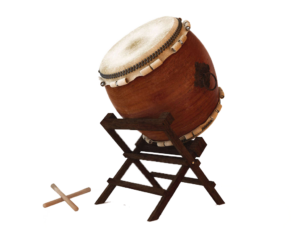 In Japanese, the term refers to any kind of drum, but outside Japan, it is used to refer to any of the various Japanese drums called wadaiko and to the form of ensemble taiko drumming more specifically called kumi-daiko. Taiko have a mythological origin in Japanese folklore, but historical records suggest that taiko were introduced to Japan through Korean and Chinese cultural influence as early as the 6th century CE. Some taiko are similar to instruments originating from India. Their function has varied throughout history, ranging from communication, military action, theatrical accompaniment, and religious ceremony to both festival and concert performances. In modern times, taiko have also played a central role in social movements for minorities both within and outside Japan.